Craft beer has a complicated relationship with pilsner. It’s the world’s most widely consumed, most widely copied and emulated beer style, but the vast majority of those beers either don’t actually qualify for the “pilsner” style guidelines or come anywhere close to the Brewers Association definition of “craft.” And yet, it’s also a style with a rich history, dating back to the famous ur-pils of 1842, Pilsner Urquell. 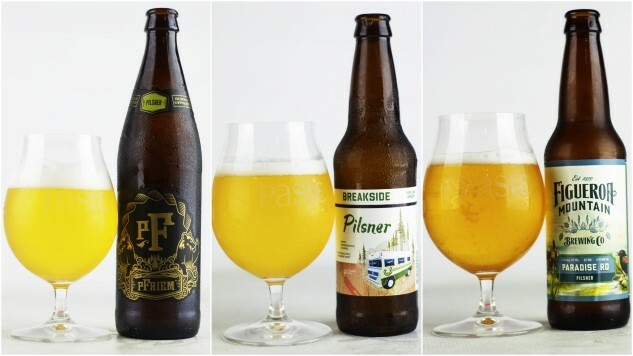 For more detailed information on the style’s history and current role, by the way, check out our companion piece: Let’s Talk Beer Styles: Pilsner, which was published when we last blind-tasted this style back in 2016. In modern American craft beer, pilsner has seen a resurgence … or perhaps the right word is reclamation. American craft brewers have refused to let companies like Anheuser-Busch or Miller present a sole definition of “pilsner” with insipid beers in the mold of Bud Light—watery, flavorless yellow suds that for decades corrupted the good name of pilsner in the U.S.A. and made American beer a punchline in Europe. Obviously, things have changed. In reality, no nation is presenting such a tremendous variety of pilsners today as the U.S.A. When you see the word in a craft brewer’s lineup, you never truly know what to expect. It could be a classical German or Czech-style pils, or a throwback “pre-prohibition” American lager. It could feature fruity, nouveau American hop varieties to such an extent that it comes off as an “India pale lager.” It might even be a faux-pilsner fermented with light, neutral ale yeast for the sake of efficiency and turnaround time … although if you ask us, that’s cheating. Regardless, you’ll find all of them in abundance these days. It is, all in all, a good time for pilsner, and a good season for pils. And so, let’s get on with the blind tasting. As in most of our blind tastings at Paste, the vast majority of these pilsners were sent directly to the office by the breweries that choose to participate, with additional beers acquired by us via locally available purchases and the occasional trade. We always do our best to reach out to breweries we’re aware of that make exemplary versions of particular styles, but things always do slip through the cracks. We apologize for a few significant omissions that we couldn’t acquire, either due to seasonality or market shortages. There will never be a “perfect” tasting lineup, much as we continue to try. - This is a tasting of pilsners, largely determined by how the breweries chose to label their products. All beers had to be labeled as “pilsner” in some capacity. No pseudo-pilsner ales were accepted. When in doubt, we simply allow a brewery’s marketing to define a beer’s style, and expect them to stick to the designation they’ve chosen. - All types of adjuncts and flavorings were allowed. There was no specific ABV limit. To our surprise, pilsner proved to be a somewhat divisive tasting. It revealed one of the rare, justifiable divergences in personal tastes between Paste blind tasters—we just came to find that some of us appreciated a different sort of pilsner than others. As a result, there often wasn’t much consensus on each day of blind tasting. Whereas some tasters tended to prioritize getting an expressive noble hop character in their pilsners, others focused more on a clean, crisp malt character as the most important element. Still, there were some occasions when a beer perfectly lined up in such a way as to please every palate. Unsurprisingly, those are the pilsners that did best. Conversely, the worst-performing pilsners were often ones with obvious brewing defects. Sadly, there were some downright buttery, papery, funky or otherwise messed-up lagers in this tasting. Likewise, it was rather difficult for pilsners with unusual adjuncts (such as fruit or spices) to rise to the top in a field where crisp grain and hops are the norm. Good on ya for trying, but citrus ginger pilsners are still a tough sell. As always, the beers below that didn’t make the top 50 are simply listed in alphabetical order, and as a result are not ranked. I repeat: These beers are not ranked.